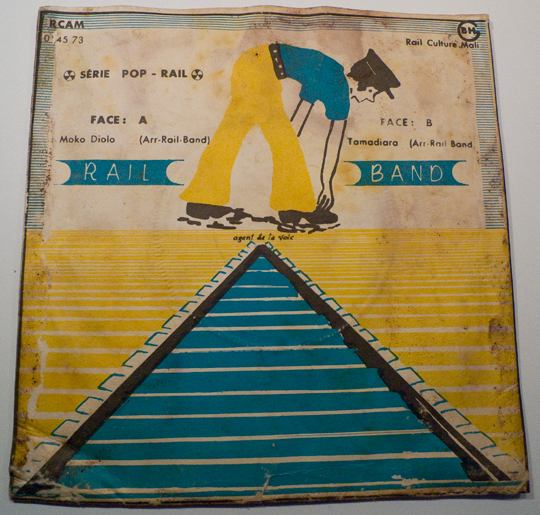 Today’s random single from the collection is “Moko Dialo” by the Rail Band. This is on the RCAM label (Rail Culture Malienne), catalog number 014573. The 7″es were pressed in France, but the sleeves were printed in Mali. Both sides are explosive mandingo funk, but especially the B-side, “Tamadiara” – a real classic. There is a second single with a similar cover with two great (but not quite as great) songs, RCAM 024573. The back of the picture sleeve informs you that you can catch the Rail Band performing at the Buffet Hôtel de la Gare in Bamako, the capital of Mali, at 7:30 PM every Tuesday, Thursday and Saturday. Now, sadly, Mali is in civil war. See a Rail Band discography here. And for more detail, read the excellent article on the band in Wax Poetics issue 39 (cover featured either Fela or Tony Allen).